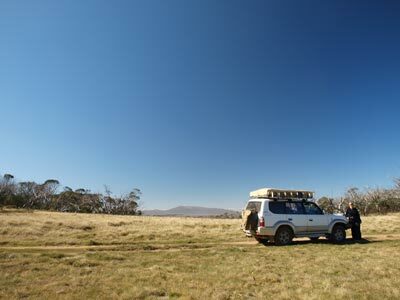 For Easter 2012, we decided to do a trip to the northern-most part of the Victorian High Country. I had originally planned to do a trip to another spot but our friends Ron and Donna, who we do a lot of our 4WD trips with, asked if I could change the trip to the high country as they had never been there before. Unlike most years when we take at least the Thursday before Easter off and sometimes the Monday, this year we were limited to the normal days as both Ron and Kelly were acting in higher jobs at work and could not take the extra days off. 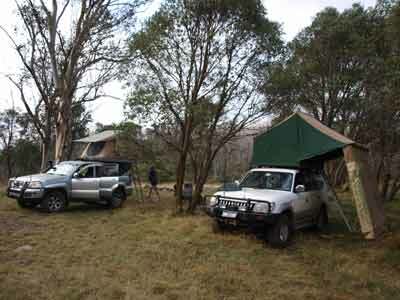 Therefore on the trip were Ron and Donna in a Toyota Prado 120 series and Kelly and I in our 1999 Toyota Prado 90 series. As we could not leave till after work, we still decided to leave on the Thursday although time-wise, we would not really be any better off. Kelly's thoughts were that at least we spent the night under the stars! We left home at 5:30 pm and travelled via the Princes Highway and M6 to Bulli Tops and then via the Appin Road to Appin. From here we headed via Broughtons Pass to Wilton and then onto the Hume Highway. The traffic was not too bad, with no delays at all anywhere. Once on the Hume we headed south. What we did encounter was a maniac truck driver who kept changing his speed and then overtook me (despite me doing 100 kilometres per hour by the GPS - they are supposed to be speed limited to 100). Then, he cut across in front of me before he had got of the way ahead of me and forced me to slam on my brakes. The truck was operated by DRT Logistics (Damorange Refrigerated Transport) and had rego number VV 39 IF or similar and trailer VT 59 KB. Not only did it do this to me, it continually cut in front of other cars. Finally he slowed going up a hill and I passed him and we never saw him again. I later lodged a complaint with them but, of course, they did nothing. Our plan is to camp at Wingello State Forest. This is a spot we camped at in May 2011 and found to be close to the highway and also a nice spot. It is a bit hard to find, as there are no directions to it on the state forests web site. To get there, turn off the highway at the signposted road to Wingello. Once you come to the village, cross over the railway line and then turn right. Take the first left which is Forest Road. This will led to the state forest and the HQ Camping Area. We arrive at 7:30 pm and find only three caravans here. We select a spot on the opposite side of the track to them. The whole area is a flat relatively open pine forest. There is a toilet here but that is all the facilities. It is free. As we are starting to set up, I get a call from Ron and find he is not far behind us. Kelly has cooked us curry beef and rice and as I set up the chairs and get the fire going. Kelly heats up the dinner as well as opening the Shippshape. I get us a drink and within a few minutes Ron and Donna arrive. They also have a roof-top tent and it does not take them long to be sitting around the campfire while Kelly and I have our dinner. We chat and drink around the fire, the nearly full moon rises and is quite spectacular in the clear sky. It is quite high here, 663 metres according to our GPS. It is so bright, almost like daytime! We head off to bed at 11 pm. We have not planned an early start, but the imbeciles in one of the caravans starts a generator at 6:30 am. It seems they wanted a coffee! Fair dinkum, no consideration for anyone else. It is not even a quiet generator. At least it only runs for 10 minutes or so. Lots of birds are around, so at least once it stops we have something nice to listen to. There are crimson rosellas, yellowtailed black cockatoos, king parrots, magpies and more. Their noises are so relaxing. I am up at 7:10 am after listening to the ABC Radio News and Kelly is up at 7:30 am. We have a quick breakfast and dare ready to go pretty quickly. It is now a sunny 16ºC. The plan today is to head south via Queanbeyan, Cooma and Jindabyne and then via Thredbo into Victoria. There is a lot of traffic on the road as today is also the first day of the school holidays. However, we are never really slowed below the maximum speed. We take the Federal Highway south of Goulburn and as we pass Lake George we see that there is a little water in it, more than we have seen for many years. It is surprising it is not full, considering the rain of the past few years. Once past Queanbeyan we take the Monaro Highway. At 10:30 am we stop at the Colinton Rest Area which is about 11 kilometres before Bredbo. We have morning tea here and a stretch. Kelly takes over driving and we leave at 10:55 am. We get to Cooma just before 11:30 am. I need to put some fuel in the car so as to make sure we have enough for all contingencies. Ron's diesel does not need any at all. I take 56.4 litres at $1.579 a litre at an average of 13.33 litres per 100 kilometres. Reasonable considering the high speeds and the load we are carrying. 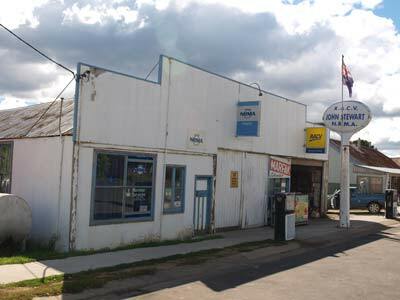 We leave at 11:35 am and head to Jindabyne on the Snowy Mountains Highway and then the Jindabyne Road. Lake Jindabyne is totally full, I have never seen the water as high as this. We stop for a few minutes as I forgot to buy a newspaper to read over the weekend. 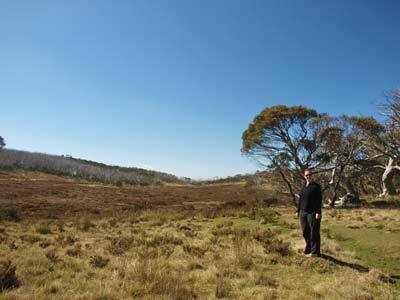 We take the Alpine Way a few kilometres out of town and head towards Thredbo. Just before we enter Kosciuszko National Park I spot some cut timber on the side of the road. We turn around and go back and collect it. It is a bit green, but should burn alright. Wonder who went to the trouble of cutting it but not collecting it? We head through Thredbo but do not stop here but keep going south. I have never been on this section of the road before. It used to be all dirt past here but is now tar. It is a reasonably good road, although quite narrow and windy in spots. At 1:20 pm we come to a few nice camping area called Leather Barrel Creek Camping Area. We stop for a few minutes to have a look. There are fireplaces, tables and toilets. There are quite a few spots, but the pick of them is the one closest to the creek crossing. At 1:37 pm we come to the Tom Groggin Camping Area. There are a lot of people here, too many, although there are plenty of spots. We would only stay here if this was the last resort. I have no idea why there are no people at the Leather Barrel Creek Camping Area which is only 7.5 kilometres up the road. We head along the track that leads to the border crossing. It is two kilometres to the Murray River which is the border. An interesting fact is that the border is not the centre of the river as most people think nor is it the edge of the water on the southern side (as it was legally thought to be till 1980) but is the top of the bank on the southern side of the river. The clarification of the border was decided by the High Court of Australia in 1980 when a murderer called Ward appealed his conviction. Ward had shot a bloke called Reed who was standing below the river back while Ward was on top of the river bank on the southern side. Ward was charged and convicted of murder in Victoria. He appealed all the way to the High Court which decided that the border was the top of the river bank, not the water's edge. Therefore, Ward was freed as he did not commit a murder in Victoria. He was rearrested by NSW Police immediately he was released and then tried and convicted of murder in NSW, even though he had been in Victoria when he killed Reed. Therefore, the whole of the Murray River is in fact in NSW except for the tiny bit near its headwaters (more about this later) and where it goes into South Australia. I stop before the crossing and walk to a spot where I can see the river. To cross the river you need to drive through it. It is not a causeway as such, but a shallow section of the river. I look at the exit point (which I have seen from the other side on 31 December 2007) and check that the water is not too deep. I plan my way across by taking aim at some rocks on the other side. There are now some other vehicles behind us and they watch me as I prepare. I turn on our GoPro video camera which is mounted on our driver's side exterior mirror. I inch to the water's edge and reassess the way I need to go. I head off. The first section is not too deep but towards the other side it gets deeper. As I go I can see I should have been a little more to the right. I easily cross and stop on the other side. Ron goes next and he heads a bit to the right of me. It is a lot shallower where he goes and he makes it across without problems. The other vehicles follow Ron's line. It is now 1:51 pm. 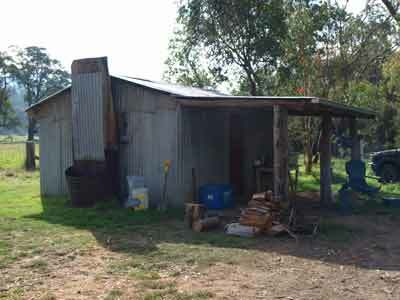 We turn right and at 2:00 pm we are at Dogmans Hut (also known as Darkies Hut). There is a family camped here. We decide to have lunch. 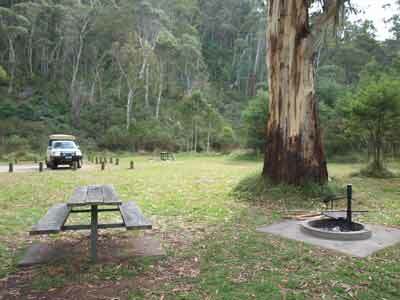 It is a very nice spot right next to the river, with lots of shady gum trees. There is also a toilet and some tables. We leave at 2:25 pm and backtrack to the river crossing. We continue south and pass the SCG Camping Area (Seasonal Closure Gate - you cannot go past here from mid-June to early November) and at 2:50 pm we come to Buckwong Creek. This is six kilometres from Dogmans Hut. 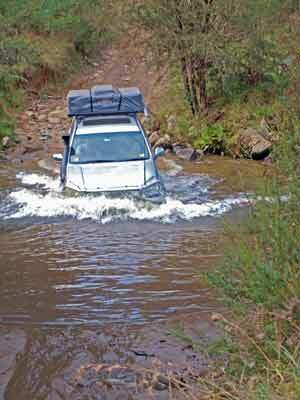 The creek is short but deep, coming up over the bonnet to the windscreen. This is a nice camping area, but there are a few cars here and also some more who have just arrived before us. At 3:45 pm we come to a large mud hole that covers most of the road. It is deep on the right hand side. I get out to photograph Kelly (who is still driving apart from the river crossing). She attempts to go high to the left of it but right at the end the rear right wheel slips sideways and into the mud. Her momentum gets her through easily. At 4:10 pm we arrive at Davies Plain Hut. We cross the Davies Plain Creek and climb up to the hut and the Davies Plain Hut Camping Area. The best spots near the hut and in a cleared area nearby are already taken. I have a look near the horse yards but there is only room for one vehicle. There is plenty of space near the hut, but it is open and has a bit of a slope. Ron suggests a track that headed off the to the right as we came up from the river. There are some others camped near here a bit further along. We head back down and Ron radios that it is a great spot. It is only 50 metres off the track and overlooks the creek crossing. 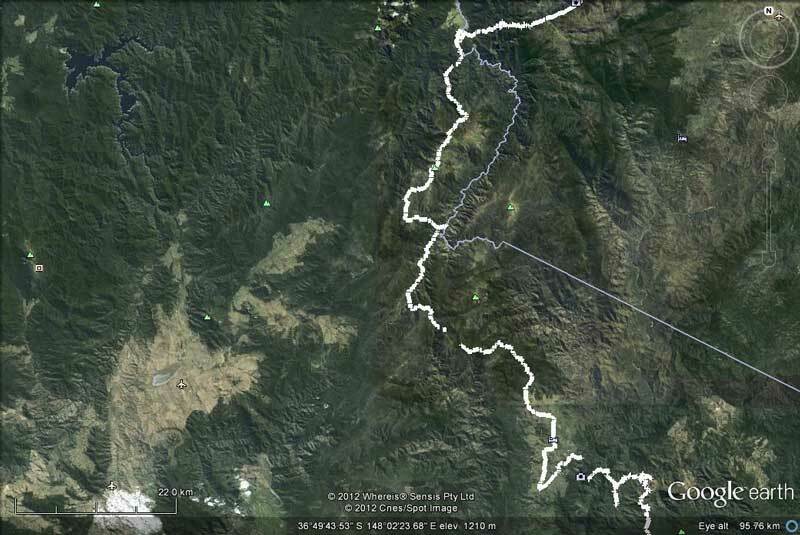 The GPS co-ordinates are S36º 38' 52.6" E148º 07' 36.8" using WGS84 as the datum. The track is off to the left about 30 metres after crossing the creek. The spot has enough room for half a dozen cars/tents. It is a bit open to northerly winds, but they tend to get pushed up and over the camp site. We set up camp and I prepare the Twine hot shower in my car for use. I erect the shower tent and heat up the first lot of water for myself. I have a lovely hot shower using a full 10 litres of water. You feel so much better after a shower and a shave. I walk down to the creek and get another 10 litres for Kelly to use. Then Ron and Donna have showers as well. The most used piece of equipment I ever put in the Prado! After showers, we have nibblies and drinks. It is a bit windy and the smoke from the fire moves all over the place. This will be a bit annoying I think. At 5 pm I remember that South Sydney is playing Canterbury so I turn on the radio. Brilliant, Souths win against the favoured Bulldogs! Kelly is cooking creamy garlic prawns as an entree for us all and she cooks this up. We have it with crusty bread. Very nice. After a break, I cook calamari and salt and pepper squid for Kelly and I. Again, a great meal. After dinner we sit around the fire and have a few more drinks. There was a fair bit of timber left here so we are burning that as well as some of the stuff we found this morning. It burns okay once it is hot enough. It is now overcast and the winds increase a bit. we go to bed about 10 pm. I am awoken later when the winds get very strong. The awning of the Shippshape is flapping, but it has not come free. The wind is from the north-west. Later, the wind has dropped as I do not hear it when I wake about 3 am. However, it is now very cold so I figure that the cloud has disappeared. It was very cold last night as it is almost 1500 metres here. I get up at 7:30 am (warmed to 3.2ºC!) and have breakfast. It is nice and sunny and when you are out of the shade, quite nice. However, by 8 am it is 75% cloudy and a light breeze has sprung up making it feel quite cold. Once we pack up, we drive down to the creek to refill our water containers. We then head up to the hut so that Ron and Donna can have a closer look and also so we can use the convenience there. We leave at 9:20 am. We continue south on Davies Plain Track. By now the sky has cleared and the temperature a balmy 10ºC. The track is very rough, mostly first and second gear high range. At some of the hills we use low range second or third, not so much because of the steepness of the hill, but because it is so rough and we want to go slow. We come to the intersection with Kings Plain Track and there is a bloke with a Nissan Patrol sitting there in his deck chair. We stop and speak to him and he tells us that he has two mates down the track and one of them has problems. This bloke has a hole in his radiator and they are trying to patch it up somehow. We have nothing on us that we could use to help, so we continue on. We are gradually climbing higher. 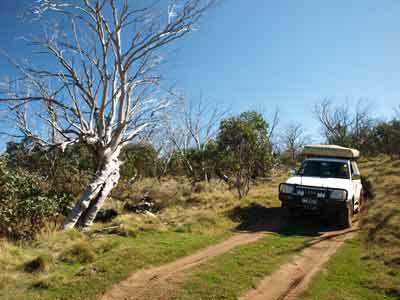 At 10:33 am we arrive at Charlies Creek Plain Camping Area. This is 13 kilometres from Davies Plain Hut, so as you can see it is slow going. This is a very nice camping area, with space for perhaps 12 cars. It has a fire pit but there is no toilet. We have morning tea here. It is still only 11ºC but not too bad as the wind has dropped. We leave at 11 am. The track continues to climb. 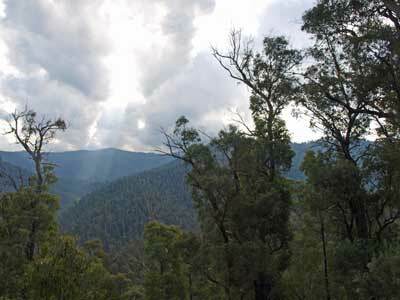 At 11:40 am we come to the intersection with McCarthys Track, although some maps and books say that McCarthys starts back about 8.9 kilometres back at the intersection of Buckwong Creek Track. The sign here says The Poplars off to the left. It is 12 kilometres to here from Charlies Creek. We decide to go to The Populars. 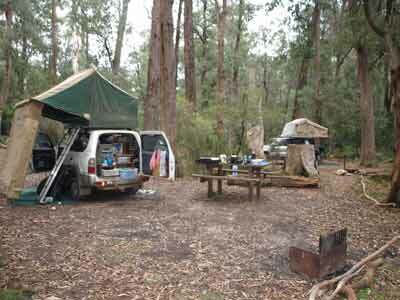 This is a camping area on the Murray River. It is also called McCarthys in some books. The track south is Limestone Creek Track which we will come back to after a diversion to The Poplars. We head down McCarthys Track. 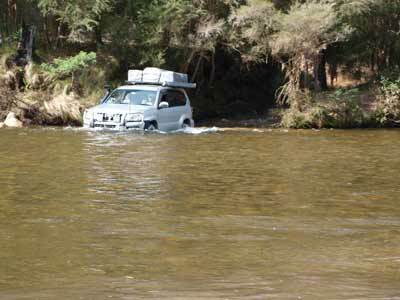 We travelled a little bit of this in late 2007 but it was so rough we turned around as we were running late to get to our camping area at Limestone Creek. It does not seem as rough today as it was then, although I doubt there has been any work done on it. It is 1.2 kilometres to the river. 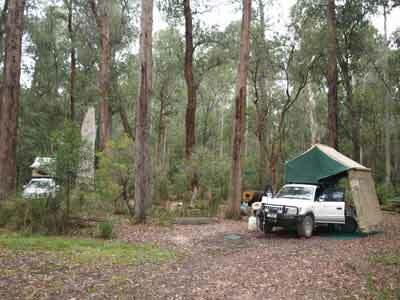 The Poplars Camping Area is right on the edge of the Murray. I thought that there would have been a lot of people camped here, but we do not see a single person. There are signs that people camped here last night. We have a look around and find some really good timber, already cut. We collect as much as we can fit in the cars. There are about three of four separate places to camp, some right on the water and others a little bit back (not too far). There is a toilet and some tables and fire places. 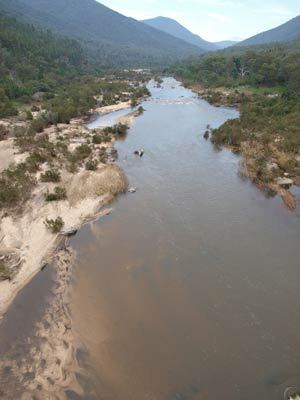 We stop right at the furthest one and you can see that at one time there was a ford across the river into NSW. However, all the tracks in NSW are closed to vehicles. Ron decides (crazily) to have a swim in the river. It is only a few metres wide here and running quite strong. It would be nice in summer, but now*@%! Ron is soon out of the water! he says it is freezing and he cannot feel his legs. It takes him a while to warm up again. We leave at 12:20 pm after a stop of 20 minutes. As we go back to the first part of the camping area, there are a dozen or so vehicles, all apparently on a day trip led by a commercial operator. Back at the intersection we take Limestone Creek Track to the south. A short distance along we come a few vehicles heading for us. This is another tag-along touor, this time run by Great Divide Tours. I move off the road so they can pass. Just past here we come to Dead Horse Creek. The tour operator has told us it is deep but passable. Kelly goes first (she is now driving) and the water comes up over the bonnet onto the windscreen. However, this is probably more because she took it fairly fast. Ron comes through without the water coming over his bonnet. On the southern side of the creek there is a nice spot where you could camp. We decide to have lunch here. It is now 12:50 pm (12ºC) and it is about six kilometres from the intersection with McCarthys Track. We are back on the road at 1:20 pm. Seven kilometres along is Limestone Creek Camping Area on the right. This is very large. We stayed here on New Year's Eve 2007 and there was only one other car here. Today there are couple of cars, but plenty of room. There are tables, fireplaces and a toilet right next to a nice flowing creek. There are also a lot of mosquitoes! After a short stop to show Ron and Donna this camping area, we continue on our way. 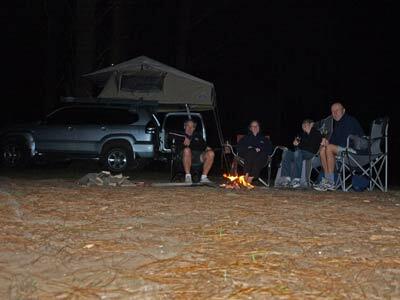 Our plan is to have a look at Native Dog Camping Area and perhaps stop here or alternatively (Plan B), head down Cobberas Track and stop at one of a couple of sites along that track. However, the people camped at Limestone Creek told us that Cobberas is closed. At Black Mountain Road we turn right. This is a good road where you can average about 50 kph. We stop at Native Dog Camping Area but it is very crowded. We decide to head on. Just over two kilometres along Cobberas Track comes off to the left. Sure enough, it is closed, the gate locked. We continue on Black Mountain Road, reverting to Plan C for the day. This is to go towards McKillops Bridge and camp somewhere between here and there. It is not too far, especially at this speed. We keep up a good speed on Black Mountain Road. At one spot we see a track off to the left and we go up there to have a look. 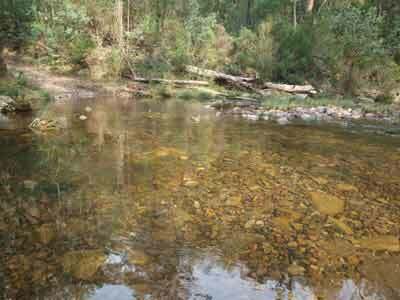 This is about 16 kilometres from Native Dog Creek. There is a nice camp site here that could be used. It is at GPS S36º 55' 25.2" E148º 12' 30.4" using WGS84 as the datum. We decide not to stop here as it is only 2:40 pm. At 3:07 pm we come to the Snowy River Road. To the left this leads to Jindabyne and to the right to Buchan. We turn right and just over 11 kilometres along we take a hard left into McKillops Road. As this intersection there are two or three Australia Post motorbikes and three riders. One is having a beer and they seem to be waiting for a support vehicle. An interesting, if slow, way to get around. 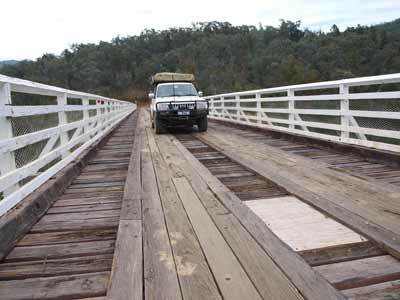 McKillops Road leads to McKillops Bridge which crosses the Snowy River. We head down McKillops Road which is a good tar and then dirt road. At 3:27 pm we come to Little River Falls. 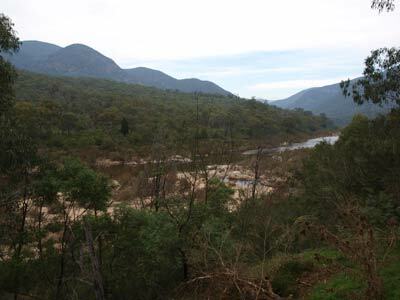 This is in the Snowy River National Park. My map says that there is a camping area here but this does not appear to be correct. There is only a couple of car parks for the walk to the falls. We do not have time to do this walk so we continue on. 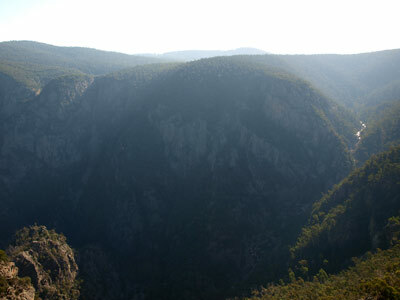 A few kilometres further along the road is the turn off to Little River Gorge. 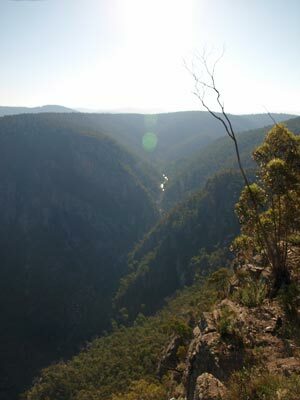 It is only 900 metres to the Little River Gorge picnic area. We get here at 3:35 pm. As well as a small picnic area that could probably be used to camp at in a smallish motorhome or roof top tent, there is a walk to a lookout. We decide to walk to the gorge as the views in our guide book look amazing. It is about 400 metres to the lookout. It is a fantastic sight to see. The gorge is really wide and extremely high. The views are spectacular, although today there is a bit of smoke from some hazard reduction burning that must be occurring somewhere nearby. I cannot believe that I have never heard of this place before. We leave at 3:50 pm and continue on McKillops Road. The road is dropping a fair bit and it is very narrow and windy. 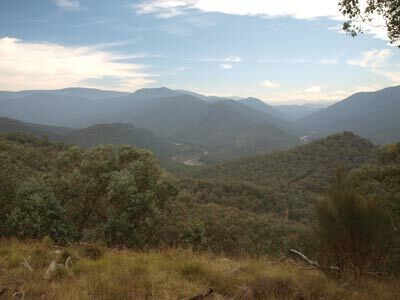 At Wheelers Gorge (690 metres) we stop as there are more great views. From here the road is a single lane with a drop of a few hundred metres to the left. This is slow and potentially dangerous driving, with great care taken to ensure no cars are encountered on the sharp right-hand corners. Luckily we meet no cars coming up the road. In spots you can see where some vehicles have gone so close to the edge that they had less than a few millimetres between the outside of their tyre and the drop. A bit too close for my liking. 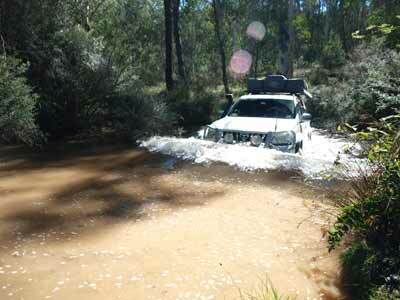 We are using a 4WD book that tells us that there are four camping areas on the Snowy River. One is called Little River Camping Area. We come to the intersection where the road heads off to it. This is a 4WD only road, so we figure that there will be less people here, so this is where we decide to go. It is a very steep descent of 3.2 kilometres, with high first and second and sometimes low second and third needed. There is a huge amount of fallen timber on the road in so you can safely leave it till here to collect some for your fire. At 4:35 pm we arrive at Little River Camping Area. 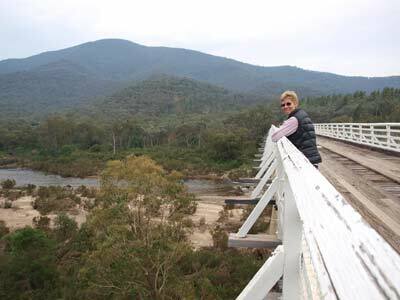 This is situated at the intersection of the Snowy River and Little River, but is very high above it. It would be quite a scramble to get down to it and back again. 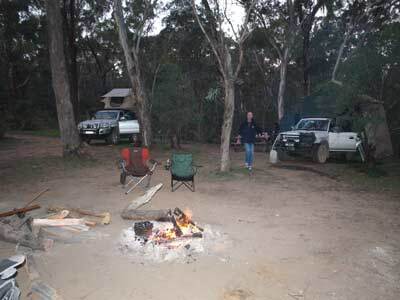 There are three or four different sections of the camping area. We end up choosing the upper one which not only has no-one else there, it is probably the flattest bit. there is space for about four cars here. The other areas are much bigger. We have a BBQ, a table and an ad-hoc fire place made from large rocks. There is also a toilet about 100 metres away. The camping area is at 201 metres. We set up camp and get a good fire going. Ron and I split the logs we have collected over the past few days and he piles the fire high with the timber. We need lots of coals for a baked dinner. After this, I put on the shower and we all have nice, hot showers. Kelly is also cooking her sticky date pudding for dessert so she prepares this while I peel and cut the vegies. We are cooking a chicken while Ron and Donna are doing pork. We will share the meats. Donna steams some pork buns which are a very nice entree. Ron puts the pork on at 6 pm and we put the chicken on at 6:30 pm. We add the vegies 20 minutes later. We take it all off at 7:30 pm. Unfortunately, the chicken is not totally done, but we can get enough off it to start eating. The vegies could also have done with a few minutes more. The chicken goes back on the coals and after 15 minutes the rest is done. A really great meal as normal. After a rest, Kelly puts on the sticky date puddings (done in small foil trays) and she makes up her caramel sauce. We have the puddings with dollops of double cream. This dessert is as good as any I have tasted from the best restaurant. After we eat, she puts the other four on that we will have tomorrow night. After dinner, we sit around the fire and relax some more. We go to bed at 10 pm. It is now cloudy and about 14ºC. It was a lot warmer last night. I listen to the main 7:45 am ABC Radio news and then get out of bed at 8 am. It is now 8ºC and sunny, although it comes over cloudy by 9 am. I have breakfast and Kelly gets up a little later. We pack everything up and leave at 9:30 am. 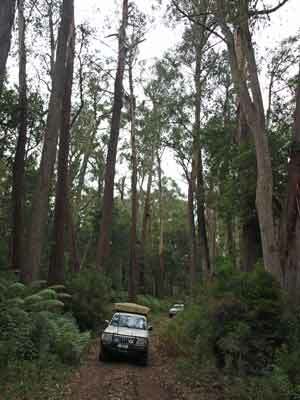 It is a steep climb back out of the camping area and we come across a couple of blokes from the other vehicles who are collecting more timber for their fire. At the top of the hill we see two of the postie bikes that we saw yesterday. They are parked on the side of the track but their riders are nowhere to be seen. We wonder where they are. It takes 15 minutes to climb the 3.2 kilometres back to McKillops Road. We turn right and descend towards the Snowy River. The track winds around the mountain side. There are great views to the right to the river and at one spot we see lots of people camped on the other side of the river. We never do figure out how they got there as we see no road to the camping area nor any signs, even once we cross to the other side of the river. At 10:05 am we stop at McKillops Bridge Camping Area. 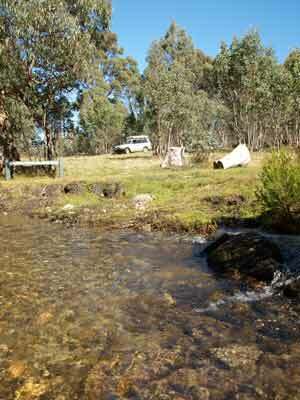 The 4WD book we are using calls it the Snowy River Camping Area, but this is not its name. 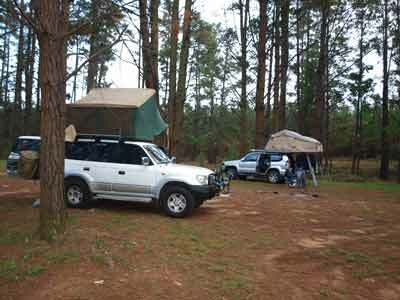 It is a huge camping area, with separate sections for caravans and camper trailers. This section is quite steep and I do not think I would want to stop there. The camping part is better, but I think where we stayed was a much nicer spot. 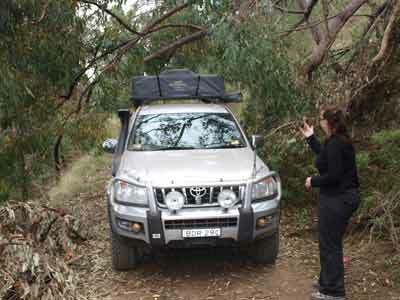 Of course, you do not need a 4WD to get to this camping area. You also have to pay I think, but we saw nothing to indicate the cost. We head off after a quick look around and at 10:20 am we arrive at McKillops Bridge. 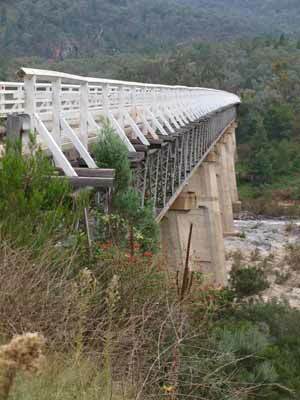 This is a 256 metre long bridge built of concrete piers, steel trusses and then a timber stockbridge superstructure. The bridge was started in 1931 and completed in 1933. In January 1934, just before its official opening, a huge storm caused a mass of water to flow down the Snowy River. The new bridge was washed away. The bridge was rebuilt, this time five metres higher (it was already considerably above the normal water level). It was completed in 1936. The bridge was considered an engineering marvel in its day, and even now it is quite a sight. We stop to have a look and take some photographs. 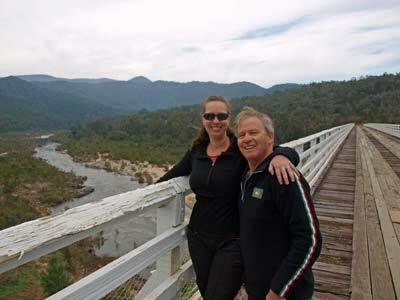 We walk onto the bridge as it also gives us the opportunity to look at the Snowy River. 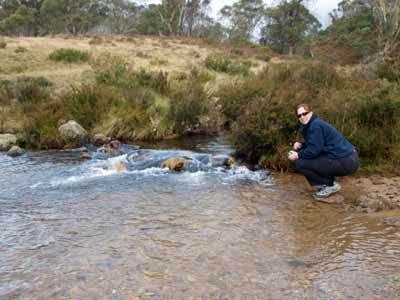 This has a good flow in it, both because in March 2012 there were huge floods and because Lake Jindabyne is still releasing water into the river as it is nearly full. 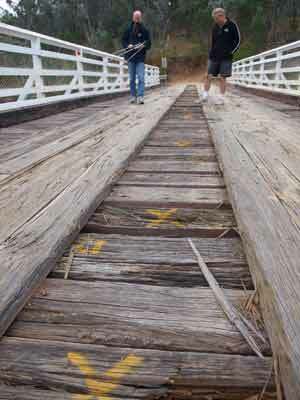 We walk across the bridge and notice that the decking is not in very good condition. Probably 50 to 75% of the main timber deck is rotting or rotted. These are mostly marked with a yellow X. In some places you can push with your foot a deck timber and it totally flexes up and down. This is timber that should be 75 or 100 mm thick! The decking is overlaid with thinner timbers that run parallel to the direction of the bridge. These are at least okay and spread the load of a vehicle across a dozen or more deck timbers. 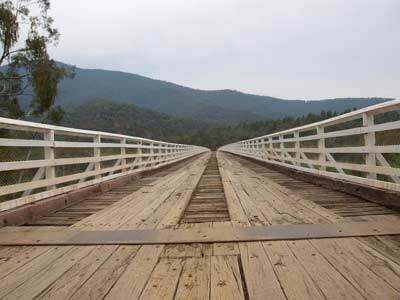 The fact is that timber bridges can have multiple failures of structural timbers before the whole bridge fails. After a while I decide to drive across and Kelly photographs me as I go while I record it on video from the car. Once on the other side I park and wait for Ron to drive across and the ladies to walk over. On this side of the river there is a large picnic area, toilets (Kelly said they were disgusting) and a kayak launching area. We have a look under the bridge as well. The guide book we are using says that there are two camping areas near here, but we see no sign of them. We head off and after a couple of kilometres I realise that we are going the wrong way. It seems that we should have turned down a track that I saw about one kilometre back. We check the guide book and sure enough, we are heading in the wrong direction. The map section of the guide is less than accurate when it comes to showing the route. We turn around and soon come to Deddicks Track. This comes off on the left side as we come to it (right side from the bridge). We take it and a few hundred metres along we come to a laminated paper sign at a gate that says that the track is closed, albeit a fair way ahead. It says that the closure is between Bowen and Rich Knob Tracks. 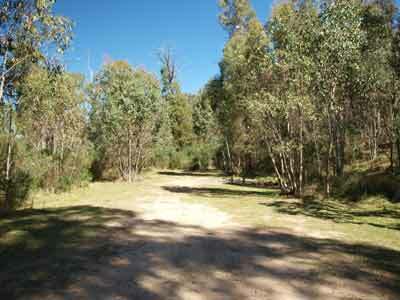 We decide to go on as we figure that we can take an alternative route at Bowen Track that will still get us to our aim for tonight, Waratah Flat Camping Area. 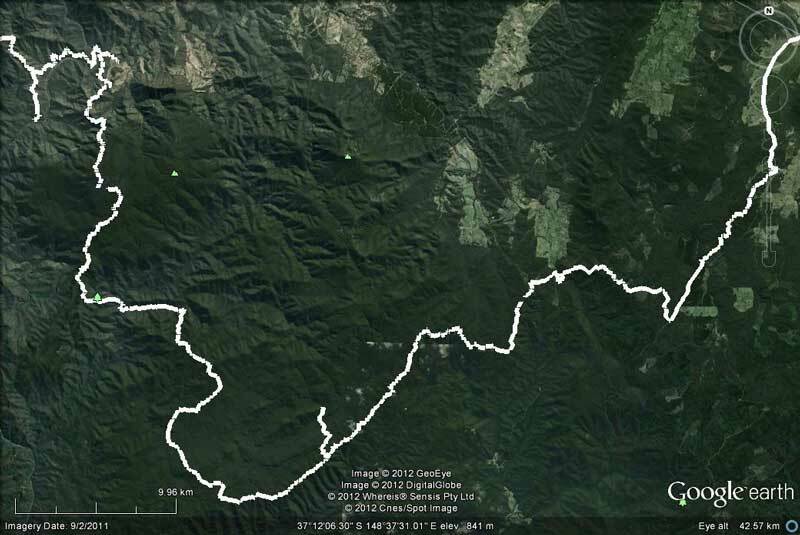 This would be to use Bowen Track and then Waratah Flat Track. 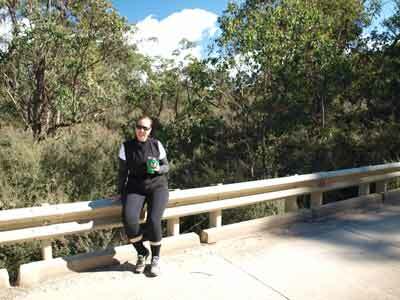 At 11 am we stop for morning tea at a small lookout that has views over the Snowy River. It is about 800 metres down the track and at S37° 5' 28.1" E148° 25' 8.5" using WGS84 as a datum. We leave at 11:15 am and five minutes later we have to stop as a Toyota 4Runner is coming from the opposite direction. The track is so narrow I have to back up about 50 metres so that the 4Runner can pull over to a spot where we can pass. We stop and chat to them and find out that they have come from Waratah Flat (at least that is what they told us) and that they have come all the way along Deddick Track. They tell us that the track is definitely open, with no sign at the other end. Interesting! We continue on and about two kilometres on we stop as there are some more nice views. When stopped here we hear and see another vehicle coming up behind us. However, we never see or hear it again. All along this section of the track we have noticed small bird houses in the trees on the side of the track. We wonder who put them there and why? The track has very high erosion bumps and you need to slow before going over them. At 12:05 pm we come to the intersection with Bowen Track. We have travelled 10 kilometres since morning tea, that is, about an average of 13 kph (excluding stops). There is a yellow and black road sign saying "Road Closed" off the side of Deddick Track. We decide to continue on Deddick Track. Almost 30 minutes later we come to Waratah Flat Track, four kilometres further along the track. The road is a bit rougher and there are hundreds of fallen trees that were across the road. They have now been cut, no wonder the track was closed. I would have run out of chainsaw fuel before we had got a few hundred metres. Waratah Flat Track is very overgrown, it does not look like too many vehicles have been along there for a while. We keep going. There are some sections of this track that have huge trees. It is quite beautiful in spots. In other sections there are thousands of dead trees from the fires, probably in 2003. In most sections the undergrowth is very dense, mostly small eucalypts that have grown since the fires. Just past Compressor Corner (no idea at all why it is called this in the books and on maps) we come to Campbells Knob Track. It is seven kilometres from Waratah Flat Track and it has taken us 30 minutes. Twenty minutes later we come to Mountain Creek. Just before the creek there is a track off to the right and we find a nice camping area. It is large enough for a few cars. I begin to think that perhaps the couple in the 4Runner we met this morning did not really camp at Waratah Flat as we have been driving almost 2.5 hours since then. As Waratah Flat is at least one hour further on, I find it hard to see that they would have started at 7:30 am this morning. My suspicion is that they actually camped here. We drive to the creek crossing and decide to stop here for lunch. It is now 1:25 pm. 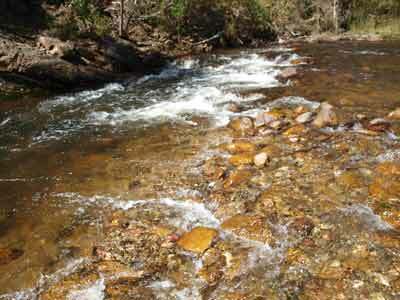 The creek is very nice and flowing well as are all the creeks and rivers. We leave at 1:55 pm with me now driving again. The creek is shallow, but there are some larger rocks that need to be avoided. At 2:08 pm we come to the Mount Joan Staircase. This is said to be very difficult. I have since read on some web sites that the direction we are driving is not recommended as it is extremely hard. 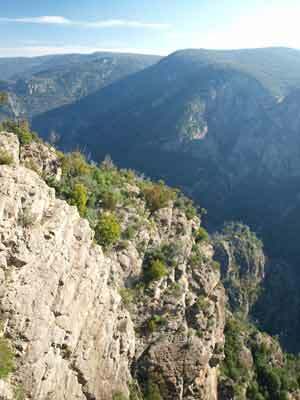 It is just over two kilometres from the bottom (430 metres) to the top (935 metres) and we average 12 kph. It is steep and we use low range second and third gear. It is not very hard, but some sections appear to have been recently touched up by a bulldozer we saw a few kilometres back. At 2:30 pm we come to the intersection with Rich Knob Track. Here we make a mistake and continue on Deddicks Track. Again, the guide book we are using does not make it clear on the map that there is a change of track. We have travelled five kilometres in 20 minutes, a bit faster than the average speed for most of the day. We expect to come to Waratah Flat soon but it does not appear. At 3:10 pm we come to a major dirt road, Yalmy Road. This is an excellent forest road. 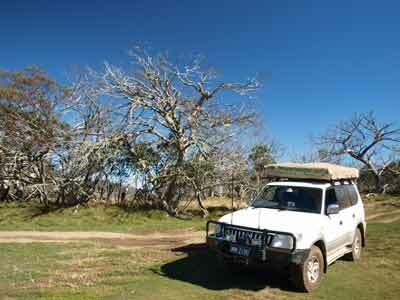 I look at the GPS and the guide book and figure out that we should have taken Rich Knob Track 14 kilometres back! This is not a big mistake as if we turn left on Yalmy Road, we can access Waratah Flat via a much better road. Eight kilometres along we come to Waratah Flat Track. 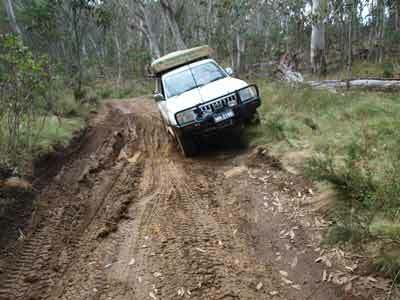 This is also a good 2WD track till the camping area. 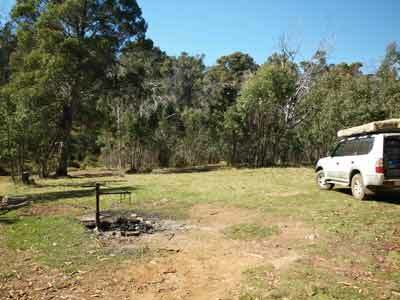 It is only 2.7 kilometres to the Waratah Flat Camping Area. It is not a bad camping area, but we decide to try to find the spot where the 4Runner said they camped. We cross the Rodger River and after 800 metres I come to the conclusion that my previous thoughts were correct. The 4Runner did not stay last night here. There is no track off the main track 100 metres (or even 800 metres) this side of the river. In fact, it is so steep that there is no possible camping area here. We head back to the river and stop. We need to collect some water for hot showers and there is a spot on the north-western side where you can get down to the water. We go back, first checking out the picnic area on the northern side of the road. It also has some spots but is a bit overgrown. 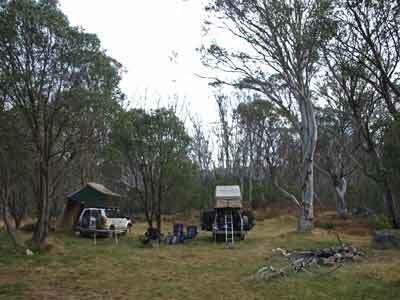 We decide the main Waratah Flat Camping Area on the southern side is better. There are about 7 or 8 spots, none of which are taken. We pick two spots that have tables and barbecues and which let us easily move from one to the other. There is also a brand new toilet which is located on the northern side of the road right next to the entrance to the picnic area. It is reasonably high here, 801 metres according to my GPS. We start a fire as it is only 12°C and it is also quite damp as it is a rainforest. We set up the camp, including the shower tent. As it is only 4:00 pm by the time we do this, I sit and relax, having a cuppa and reading a 4WD magazine that Ron has brought along. Closer to 5 pm I have a shower and then heat up the water for the others. I do not think I can tell you how great a hot shower is after a day driving along a dusty track (and the tracks have been very dusty despite what I would have thought). After showers are finished, it is time for a beer and wine. I then cook up some calamari and salt and pepper squid for us all as entrees. Dinner tonight is a barbecue and we use the Biji Barbi to cook sausages and Scotch fillet. Kelly makes a nice salad to go with this. After dinner we have the remaining sticky date pudding with caramel sauce and double cream. After this Donna gets out her nightvision monocular. We have used this before and it is simply amazing what you can see with it. There are a few brush-tailed possums wandering around and it is easy to follow them in the pitch black darkness. We head to bed at 10 pm. It was cool last night due to the clear skies but at some time it has clouded over. About 6:30 am I hear a very fine rain on the tent roof. It is so light I can hardly hear it. I get up at 7:30 am and it rains on and off, but is never heavy enough to make us get under cover or even get our rain jackets. We have breakfast and then break camp. There is a high overcast that is dropping the fine rain. By the time we leave at 9:00 am it is 9°C. We head back to Yalmy Road and turn left. Our plan is to head home via Delegate, Bombala and Cooma. 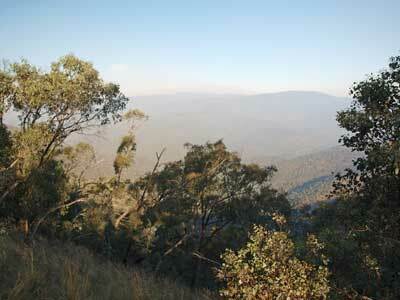 It is 27.5 kilometres from Waratah Flat to Rising Sun Road. If you turn left here you come to Bonang. We turned right and 600 metres on we turn left into the Old Bonang-Bendoc Road. 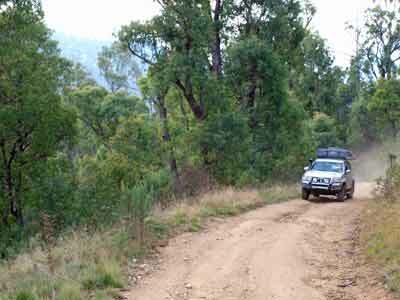 This is a good forest road and is easily travelled by 2WD vehicles. Almost four kilometres along this track we turn right at Playgrounds Quarry onto Playground Track. I do not think the road is signposted, but the quarry is. After another 6.5 kilometres we come to Gap Road. Here were we turn left and head towards Delegate. It is just over four kilometres to the Delegate River. 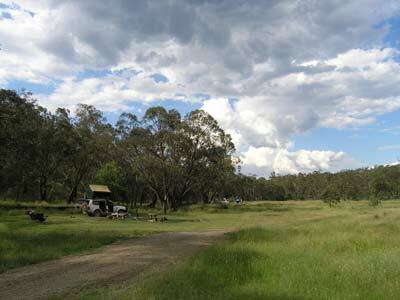 At 10:10 am we arrive at the Delegate River Camping Area, 44 kilometres from Waratah Flat. This is next to the river, but there is no real access as the river is totally overgrown with vegetation. Even at the road it would be hard to get down to the river for water, let alone a swim. The camping area is fairly nice, with tables (why are they so high off the ground), fireplaces and a toilet. The camping area has some nice flat areas. There is also a picnic area nearer to the road with tables. We have morning tea here and leave at 10:35 am. 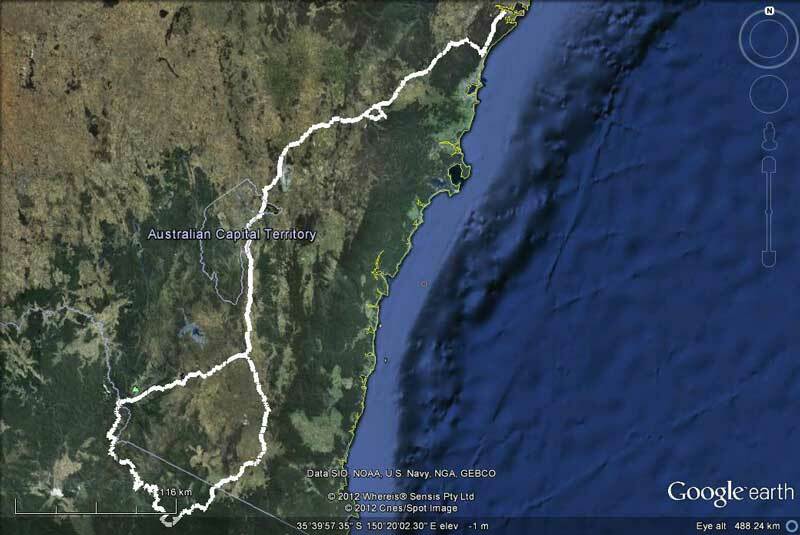 It is not far to Delegate (10:55 am - 26 kilometres) and on the way we pass back into New South Wales. 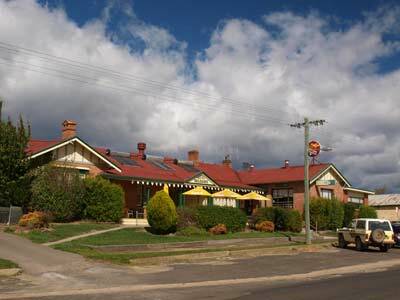 Delegate is a quaint little town, with a very nice hotel, a general store and takeaway. 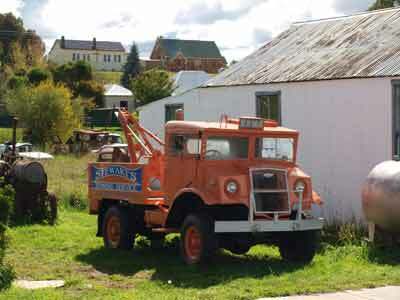 There is also an old-style garage with an old Chevrolet Blitz tow truck. We only stop so Ron and Donna can get some bread (which they cannot get). We are now back on tar roads and we head to Bombala. After a quick stop at Bombala at 11:30 am so Ron and Donna can get bread (during which the bakery has a fire and the alarms go off), we continue on our way. As we go out of town we see a very nice picnic area alongside the river. We pass through Nimmitabel at 12:15 pm (53 kilometres) where there is another nice picnic area next to a small lake. At Cooma we stop for some fuel (do not fill it) and then at Bredbo we stop for lunch. Kelly and I purchase some nice pies at the pie shop and we meet up with Ron and Donna at the rest area in town. It is 1:30 pm as we leave. We have a pretty good run, even though there is a lot of traffic on the Hume Highway. We stop for a couple of rests and driver swaps and apart from a slowing north of Mittagong where the traffic is entering the highway, we have no problems. We get back home to Kareela at 5:48 pm. Once again we have had an excellent time. We have revisited some spots Kelly and I first went to over four years earlier and seen other spots we have never been to. 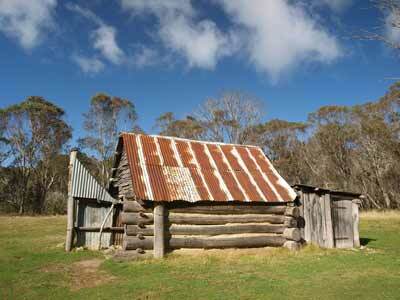 There is so much to see in the Victorian High Country I doubt that three months would let you see it all. Apart from fuel and food costs, we did not spent anything on accommodation. The fuel cost was $312.86 in total, with an average of 15.5 litres per 100 kilometres used, not bad considering the very slow going for the best part of three days. Well worth doing, but probably better done over an extra day or two.